Nowadays, it is essential to have a tool that allows you to create and read barcodes and QR codes. In the past, barcodes were used to track car components or manage the warehouse stocks of different industries. Today, barcodes are used almost everywhere. This article describes what are the best apps or software to scan, create and decode barcodes from your electronic devices. 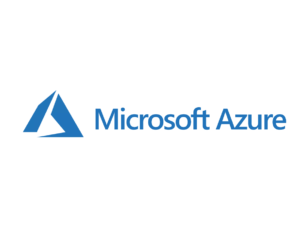 You can find those tools online or download them via the Windows Store. In this article, we select 7 of the best barcode software and we’ll explain to you how to use them online or download them on your Windows 10 computer. Barcode Maker is one of the most popular software for generating barcodes. The latest version of the tool is Barcode Maker 8. This is a software able to respond to every need with a lot of features, not easily reachable in the other barcode generators. 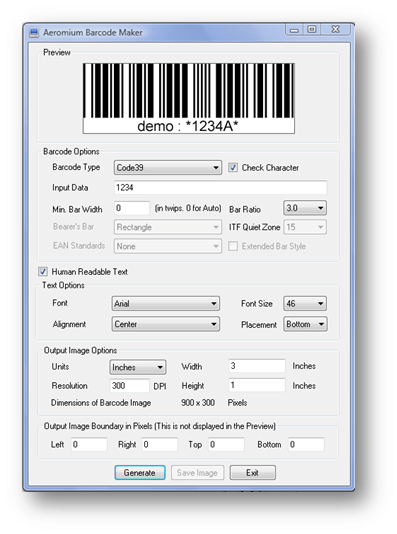 The Barcode maker, in its latest version, supports virtually all barcode types. 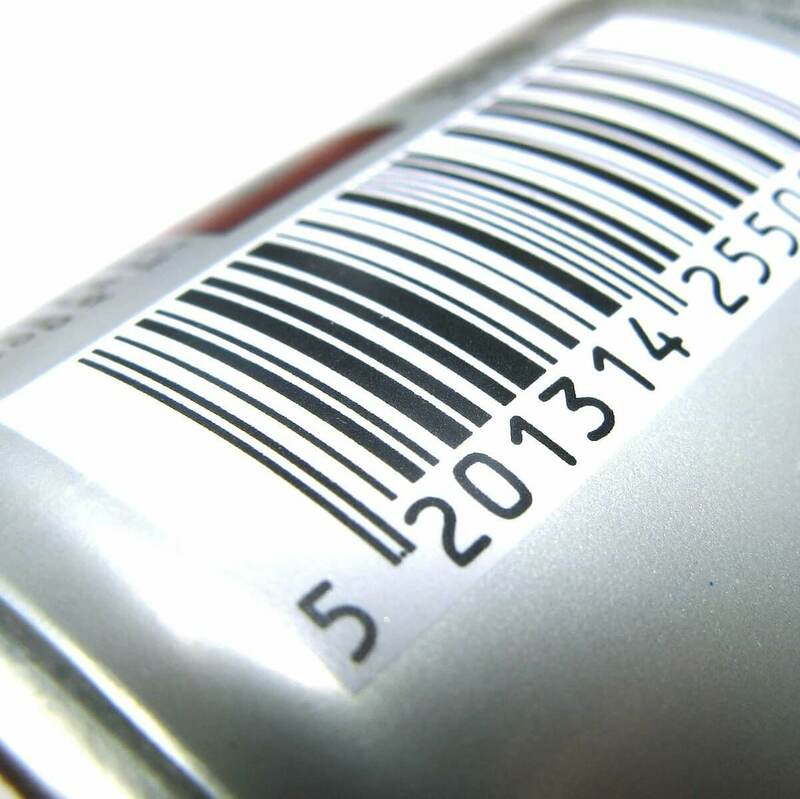 Among them, there is the most used retail barcode in the US, the UPC-A and the other worldwide spread code EAN-13. Other barcodes included are: ISBN for books, ITF-14, Code 2 of 5 Interleaved, QR Code, Code 39, UPC-A (GTIN-12, UCC-12), UPC-E. The list is not complete, but it can give you an idea of the software’s capacities. It is worth mentioning that Barcode Maker has more than 390 pre-defined label sheets included for printing. Moreover, the file formats supported include PDF, JPEG, Bitmap, TIFF and Portable Network Graphics. Visualizing the file in MS Excel is possible but users need to add the barcodes to the Barcode list to do that. One of the most popular Windows barcode application is Aeromium Barcode Maker. The first version of the software was released on February 08, 2011. The app creates professional quality barcode images. It can generate over 24 types of linear barcodes (without counting the variations) e.g. Code39, EAN13, UPCA and UCCEAN128. Thanks to the high resolution that is uses, the barcode images are suitable for different industry requirements. Aeromium Barcode Maker provides several image formats, including Bitmap, Metafile, and Portable Network Graphics. This software is very easy to use. The single dialog user interface ensures creation of barcodes dedicated to the most diverse industry needs. Users are very satisfied with this software. It can successfully meet their needs for creating in-house barcodes to barcodes for the supply chains. If you need to generate a barcode for semi-professional and/or testing purposes, visit the Online Barcode Generator’s website. This is an online service very easy to use that allows you to create barcodes using various encoding and apply numerous customization options to them, at no cost. STEP 1 – Connect to the home page of the website. STEP 2 – Select the standard to use (such as EAN-13 which is often used in publishing) from the Barcode drop down menu. STEP 3 – Fill in the fields that correspond to the items Contents, then Options and Additional parameters with all the details of the barcode you want to create. STEP 4 – Click on Make Barcode to generate your barcode. STEP 5 – Once you have visualized the barcode obtained (at the bottom of the page), you can choose to save it on your computer in various file formats by clicking on the EPS, PNG and JPEG entries. As you can see, everything is very easy and fast. Another option to generate barcodes is using the barcode generator on the Barcode-Generator website. It has a nice and intuitive interface that supports the most common barcode formats available at this moment. STEP 1 – Connect to the service home page. STEP 2 – Select the type of barcode you want to generate using the Create free menu, located at the top. Type all the info required in the empty fields. STEP 3 – Now move to the Preview Barcode section on the right, take a look at the preview of your barcode. STEP 4 – Select the format in which you intend to download into your computer, using the menu that corresponds to the words Download as. STEP 5 – Select the size from the Size menu and, then, click on the Download button. An alternative resource that allows you to generate a barcode directly from the web browser is the barcode generator promoted by Tec-it. It’s free, simple and it offers some options for customizing barcodes. Using it is a real breeze. STEP 1 – First of all, connect to the homepage of the online service by clicking the online software homepage on. STEP 2 – Select the type of barcode you are interested in generating it from the menu on the left. STEP 3 – Now fill in the empty field on the right by entering the barcode data and you will immediately see a preview of the barcode on the right. STEP 4 – By clicking on the gear icon you can also apply any customizations to the barcode (for example you can select the format in which to save the image, resolution etc.). STEP 5 – You can select Colours and Advanced Options to make further changes by clicking the Settings menu, at the top right. To complete changes click on the Close button at the bottom right. STEP 6 – Then you can download the barcode to your computer by simply clicking on the Download button. If, instead of downloading the code, you prefer to share it on the network, click on the icon with the two pages located in the upper left corner of the preview, copy the link under the heading link for this barcode image and paste it where you think is most appropriate. If you are a beginner or amateur in creating barcodes and you only want to create one with your name to have fun on social media, you can choose BarCodesInc. Do you wonder how to use it? Nothing could be simpler. STEP 1 – Connect to the homepage of the site. STEP 2 – Type your name (or any other text you want to display in the barcode) in Your text field. STEP 3 – Click on the Generate Barcode button to get your barcode to share immediately online with friends through the links and codes that appear by clicking on the item Link or Embed this barcode. If you want to download on your computer the barcode obtained as an image, click on the preview of the barcode. Arrived there, right click on the image of the balcony in the new web page that opens and select the option to save the image on your computer. The barcode will be saved as an image in PNG format. You can also customize the barcode to be generated in more detail. You can do that by clicking on the Advanced Options item and adjust settings such as the barcode standard, size, font used or image format as you want, through the appropriate menus. You can also download the stand-alone feature-rich version of BarCodesInc’s barcode generator software for advanced users. Free Online Barcode Generator is a free tool and the interface is very well taken care of. It is quite simple to use and allows you to download the barcode obtained in various formats. STEP 1 – Connect to the online page of the service. STEP 2 – Click on the first drop-down menu and select the standard you want to use. STEP 3 – Then fill in the additional fields to view by entering the required barcode details or choosing them from the appropriate drop-down menus. STEP 4 – If available, click also onto More options item to view further customization options for the barcode. Depending on what your needs and preferences are, you can modify different settings. For example, you can choose to generate a barcode with a different colour from the classic black, you can set a background colour that fits your taste and you can also define the size of the barcode. STEP 5 – Finally, press the Create button. STEP 6 – So, wait few moments for the code to be generated and then click on the icon of one of the formats available under the option “Your barcode is ready! Download now”, placed at the bottom of the page. You can download the barcode in different formats such as EPS, PNG, PDF or SVG. Once this is done, the download will start immediately. Free Online Barcode Generator shows also a preview of the code to download. In this way you can view it immediately before downloading it. 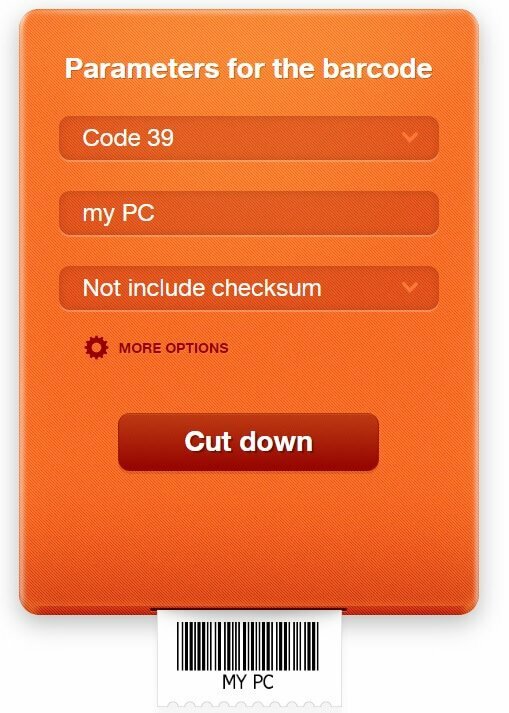 Keep in mind that if you need to make other changes to the barcode before downloading, all you have to do is press the Cut down button. This article shows you what are the best options to use if you who want to create a barcode professionally or just for fun with friends. Let us know which tool was the easiest to use for you. Comment below.